Double occupancy is defined as two adults staying in the same room. A full hearty Vermont breakfast will be served in the dining room during regular season. 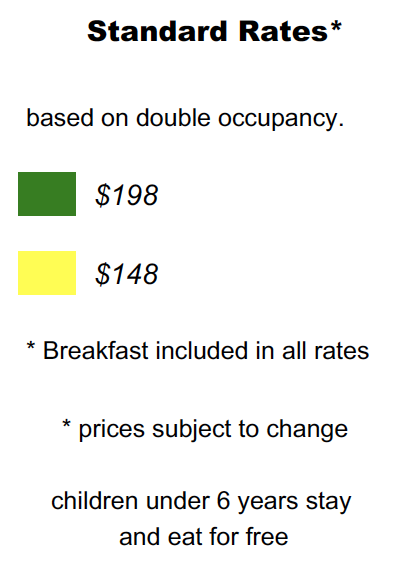 During slower times, there will be a complimentary continental breakfast in the Lobby. 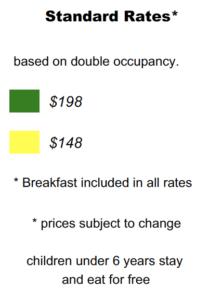 For each extra adult (age 13 and over), add $16 per night. Children age 6-12 add $6 per night. Children age 5 and under stay and eat for FREE! Pets are welcome! There is a $20 fee per day for any number of pets in a room. All rates are exclusive of state tax, resort fee, and gratuities. Rates are subject to change.